A Toronto police marine unit rescues some 1,400 people from a commuter train that had become stranded on tracks — with water up to the windows — after a record rainfall pounded the city and slowed the evening commute. 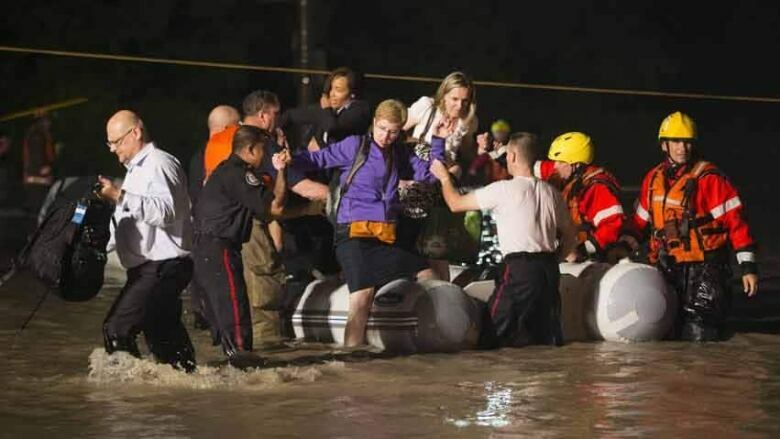 Toronto police and firefighters have rescued some 1,400 people from a commuter train that had become stranded on tracks — with water up to the windows — after a record rainfall pounded the city and slowed the evening commute. A month's worth of rain fell on Toronto in just a few hours, creating flash flooding and leaving some tracks that GO Trains use covered in water. A rush-hour train that was bound for Richmond Hill saw water seep onto its lower level and passengers take refuge on its upper deck. Mike Li, a commuter, told The Canadian Press the GO Transit train became stuck after trying to back away from the water pooling on a section of track. "People take it for what it's worth, but some are frustrated too," he said. GO Transit officials said the damage to the tracks was not yet known but Tuesday morning's service was "expected to be impacted." The transit company suggested passengers seek alternative ways to travel. "We cannot guarantee we'll have have morning rush-hour service," said one official. It was also unclear if the Toronto subway system would be in full operation by morning. Power and signal issues brought the subway system to a halt, though by 8 p.m. some stations were open again, as was the Scarborough Rapid Transit Line and most streetcars. Late Monday, the TTC's Brad Ross advised commuters to check an online Twitter feed to see the status of the Tuesday commute. The rain started arriving ahead of the supper hour, which caused severe flooding and power outages across the city. Pedestrians sought shelter where they could as they waited out the weather. For drivers, the voyage home was just as problematic. The rain made it hard to see, while the pools of water made it hard to drive and in some cases drivers were unable to move. A group of people came to the rescue of a man on King Street West, as his car became overwhelmed by water while he was making his way to a birthday party. "The water was about up to my stomach in the car and the power just shut off," George Newman told CBC News. Environment Canada said that some parts of the Greater Toronto Area were hit with more than 90 millimetres of rain on Monday. In some cases, the weather agency said the total would exceed 100 millimetres. The monthly average for Toronto is 74.4 millimetres. On Monday evening, Mayor Rob Ford told CBC Radio that "it's all hands on deck" to deal with the fallout from the storm and the damage it has caused to the city. "We've brought in crews, we’ve brought in everybody to deal with the storm," Ford said in a brief telephone interview. Initial reports from Toronto Hydro initially advised that the rain could lead to local outages. But within hours, the utility would report that some 300,000 customers were without power. By early Tuesday morning, the number was down to about 100,000. Hydro spokeswoman Tanya Bruckmueller said the approach of nightfall would be an additional challenge for people trying to turn the lights back on for affected customers. "There's not a lot that will change once it starts getting dark. It'll be harder for the crews... they need to be able to identify where the damage is so it'll take longer in the night," she told The Canadian Press. Power outages were just as much of a concern in Mississauga, Ont., the sixth largest city in Canada, which lies to the west of Toronto. Some 50,000 customers were without power after the rain on Monday. The rain caused other problems for GO Transit passengers, including delays and a few cancellations on the Milton, Kitchener, Barrie, Richmond Hill and Lakeshore East lines. Many GO buses were delayed by half an hour or longer as a result of the weather. For people hoping to fly in or out of Toronto, the rain was causing problems as well. On Monday evening, Porter Airlines tweeted that all of its Toronto flights had been cancelled for the rest of the day. Air Canada said flights to or from Pearson airport could be delayed or cancelled as a result of the weather. The powerful rains also caused flooding at Toronto's Union train station and the parking lot outside Toronto City Hall.